At Benchmark Benchtops Melbourne we specialise in concrete benchtops, concrete vanities, concrete sinks, concrete fireplace surrounds and other architectural elements, we pay attention to the fine details it takes to create quality custom concrete work. We understand concrete, and we are absolutely dedicated to quality and getting your project right and perfect. We guarantee your satisfaction! With over 10 years experience in the Melbourne concrete construction industry with an emphasis on decorative concrete, we have an eye for detail and expect to set the industry standards with every job. No matter the size or location of your project, give us a call to discuss how we can put our design expertise and professionalism to work for you. 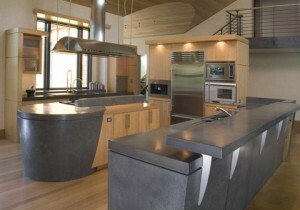 Why choose concrete for your kitchen benchtops? Looking for a new benchtop?